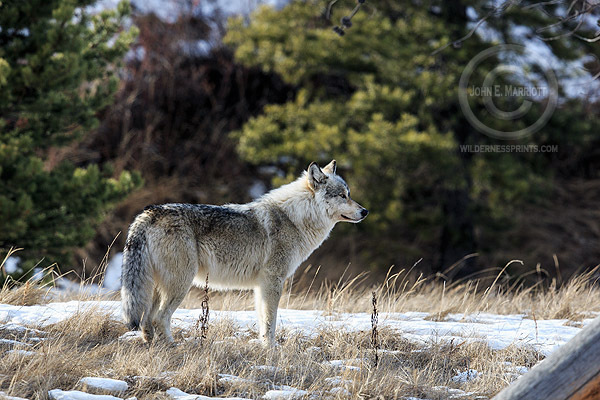 John E Marriott's Wildlife Photography Blog: Jasper Wolf Tour - First Image! Jasper Wolf Tour - First Image! After nearly two weeks on the road in Jasper National Park and beyond, I'm finally back in the office today full of tall tales and great new images from my first-ever officially unofficial 'wolf photo tour' with a few friends that happen to also double as some of my best tour/workshop clients. And while I'm going to save the tallest tales and best images for another post (for those of you that follow me over on my Facebook wildlife and nature photography page, you already know that we came across not one, but TWO wild lynx in Jasper, and I've got the photos to prove it!). While you're waiting for the next images and post, please take a moment and sign a very important online petition from wildlife photographer and colleague, Brad Hill, asking the BC Government to put an end to the use of wolf killing snares (please see my original post about just how dangerous and unethical these snares are to wildlife) and to see an immediate shift in how wildlife is managed on our public lands in BC (so that instead of protecting private businesses like ranches, the government moves to a management model that puts a priority on developing, maintaining, and protecting natural ecosystems that include apex predators such as wolves). Again, you can check out the petition at http://www.gopetition.com/petitions/stop-the-use-of-killing-neck-snares-against-wolves-in-b.html Please take a second and sign it and please feel free to pass it along. The petition will be active until the British Columbia elections begin in May of this year.